portrait of a broken family | hello, just trying to heal, here! I think that actively seeking to forgive myself and others for their role in the relinquishment of my child to adoption has enabled me to start opening up a little to my mom about what it was like for me to be in the process of self-annihilating so hideously while every single person with whom I came into contact not only watched but patted me on the back as well, telling me what a wonderful thing I was doing. I’m definitely out of the anger stage of the grieving process. In the past few weeks, where I’ve found myself in the process is having basically succumbed to a grievous, grievous horror at the realization of all that was happening. My mother is the reason I do not carry vengeance in my heart toward anyone involved because I know my mom would not knowingly cause me harm. I know with all of my heart that my mom has never wanted anything but the best for me. And my dad, for all of his hardness and unwillingness to extend mercy, wouldn’t have wished what I’ve gone through on his worst enemy. For all his shortcomings, I know he loved me too and would not wish even the most minuscule amount of harm on me. I suppose the knowledge of this is partly how I have survived up to this point and how I continue to survive. 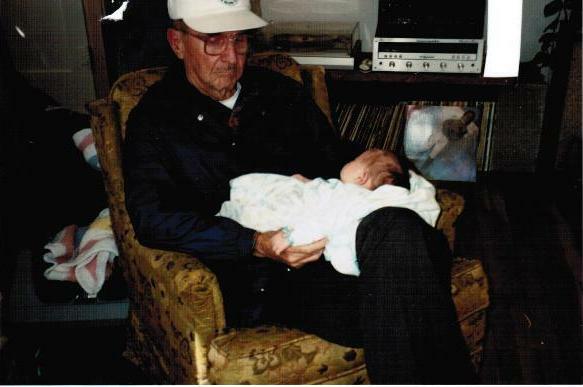 The birth of his first and only grandchild should have been one of the most joyous events of his life. Instead, this is where it left him: crumbling to pieces, as this picture, to me, clearly shows. Within 4 years from the taking of this photograph, my dad would be gone from this world. A picture can tell infinitely more than thousands of words can. Nearly 21 years later, this photo is still nearly impossible to bear and/or believe. The fact that this adoption took place is a testament to how egregiously all was not well with this family. To me, it couldn’t be more abundantly clear that this is the point at which all of the family secrets – the elephant herd that had been angrily charging in the room for decades – had hit home to deal their final death blow. As I watched this terrible process unfold of my whole world, and my whole family, falling apart, there was little satisfaction in having such a clear illustration and confirmation of how destructive family secrets can be. we are so alike, carol. my mom is also a warm, loving, kind soul who unfortunately supported the adoption, and my dad is quiet and distant and he never said one word either way, although i think he supported me too. i get angry, as you do. i wish they had fought for me harder. but i try to realize they were truly just doing what they thought best. i think i broke their hearts that they lost their grandchild, and it broke mine to do that to them. i feel horrible when i think of how they must’ve felt after meeting my baby son, but at least i know they are over it now. your picture brought tears to my eyes. you’re so brave to share something so deeply sad from your past. so much love for you.